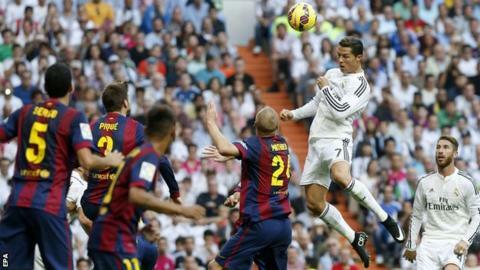 Real Madrid won the first El Clasico of the campaign, overcoming Barcelona at the Bernabeu. Luis Suarez made his debut for Barca but how did the former Liverpool striker get on? And who caught the eye among the Real players? The veteran captain has been under scrutiny in recent months but he was flawless on this occasion, having no chance with Neymar's goal before making important and difficult saves from Messi (at 0-1) and Mathieu (at 2-1). The action man full-back was beaten too easily by Neymar for the goal but proceeded to deliver a whirlwind of a performance, repeatedly bombing up and down his right flank with seemingly endless supplies of energy. Like Carvajal, the Portuguese defender could have done more to prevent Neymar's opener but he was flawless thereafter. A passionate performance was typified when he showed more desire than Barca's defenders to reach Toni Kroos's corner and power home a header. A notably restrained display from the usually combustible central defender, who has been sent off 19 times in his Real Madrid career but diligently avoided trouble on this occasion, playing a key role in shackling Messi. An outstanding performance from the Brazilian, winning his head-to-head battle with compatriot Dani Alves hands down. His forward surges consistently troubled Barca, with one cross leading to the equalising penalty, while his notoriously shaky defending was not evident this time. Should have scored with a free header just before the break but atoned for that poor miss with a perfectly weighted through-ball into the stride of Karim Benzema for the third goal. Some silky touches and plenty of commitment from the Colombian. Didn't get forward as much as usual but that was probably intentional as he played an important defensive role, showing great positional discipline to successfully nullify the threat of Iniesta. Some shaky moments during the middle phase of the first half when Barca were on top, but the World Cup winner was excellent in the second period, knitting his team together with composed passing skills. Fabulously hard-working and dynamic display from a gifted midfielder, who is fast making himself undroppable. His desire and commitment was never more evident than when he chased 40 yards to win the ball and tee up the third goal. By Ronaldo's astronomical standards, scoring only one goal - and a penalty at that - is a meagre return. But the Portuguese star shouldn't be too disappointed because he was, as always, a real handful all night. The enigmatic Frenchman has never been fully appreciated by the Bernabeu crowd, but he delivered a world-class performance - scoring, hitting the woodwork and unsettling the visiting defence throughout - to leave the pitch with his name being chanted by Real fans for perhaps the first time. Appeared late on to give the hard-working Isco a breather and played sensibly in the final stages. The German international is easing himself back from injury and came on for the last couple of minutes so Benzema could enjoy a standing ovation. Made an 89th-minute appearance from the bench and barely touched the ball. Nothing he could do about any of Real's goals and showed good handling throughout, coming out of the game with more credit than most of his team-mates. Real's opener ended his clean sheet record at 754 minutes. Not a great night for the Brazilian, whose right flank was the source of the majority of Real's most dangerous attacking moments - especially in the first half. Also did little to trouble the hosts going forward. A generally sound performance with some solid pieces of defensive work, often showing good anticipation to break up Real attacks. However, he was occasionally ponderous and blotted his copybook by conceding the penalty for Real's equaliser. Like central defensive partner Pique, the Argentine spoiled an otherwise decent performance with a costly error, getting tangled up with Andres Iniesta to provide the opening for Real's third goal. A surprise selection in place of Jordi Alba, the French international was good enough defensively and forced an excellent save from Iker Casillas with a fierce long-range strike, but was guilty of giving the ball away too often. Recovered from a hip injury to start and was an influential factor during Barca's best spells of the game in the first half, but was simply swamped in the second period and found himself struggling to protect the back four. The old pass-master showed both why he is still important but increasingly a liability. He used the ball meticulously during his team's periods of dominance, but was unable to compete physically after the hosts took over. A disappointing performance from the dribbling wizard, who didn't get enough possession in dangerous areas to pierce Real's defence and was guilty of a clanger when he collided with Mascherano to set up the hosts' third. The controversial Uruguayan made a superb start to his Barca career with an assist for Neymar's opener and also played a wonderful cross which Messi should have converted. Understandably faded and was replaced by Pedro. Frustrating evening for the Argentine maestro, who for once failed to rise to the occasion and wasted an excellent first-half chance after being found by Suarez. His game was summed up by an injury-time free-kick ballooned over the bar. Maintained his outstanding recent scoring record - he now has nine goals in eight league games - and although not everything he did came off, he was easily Barca's most dangerous attacking player on the night. The Croat will have been disappointed not to start but made a horrible first contribution, under-hitting a corner and allowing Real to break and score their third. A Clasico debut to forget. Real were totally dominant by the time he came on for Suarez, and the pacy winger was unable to change the course of the game. Came on for the injured Andres Iniesta and struggled to make an impact, doing little to suggest he is capable of becoming a truly important player for Barca. El Clasico duels: Who were the winners and losers? Read more on El Clasico duels: Who were the winners and losers?